Everything Arthur Conan Doyle thought of, but never published - because it was too fantastic. 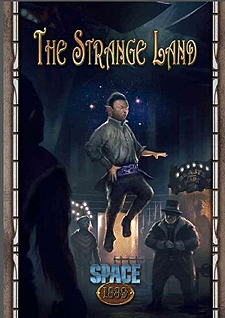 Far away from his home planet, Canal Martian boy Kime lives on the estate of Lord Feltam-Hithe who shows the orphaned child off to entertain his curious guests during his illustrious dinner parties. Not only does Kime come from a foreign planet, he also has a most extraordinary talent: his lifting gland is rudimentarily functional, allowing him to levitate in the air - although exhausting him visibly. At one of these dinner parties, the adventurers have the pleasure to meet this remarkable Martian. However, the boy disappears the same night, and it is up to the player characters to search for him immediately. Their first trace leads them to a dubious travelling circus, and in the end, the adventurers find themselves on the frontlines in the London dockworkers' strike.